Frameline honored the volunteers of its San Francisco International LGBT Film Festival at a gala appreciation party on July 1, 2009, at the Stud. Officially there were 400 volunteers at the festival this year, and they were thanked at the beginning of every film, either by the festival director Jennifer Morris, the executive director K.C. Price, or a board of directors member. More than a hundred showed up at the Stud Bar, which generously opened their doors and their bar to the women and men who took tickets, answered questions, and cleaned up the theaters between screenings. Volunteer coordinator Lares Feiciano MC’ed the raffle prize giveaway, with help from Filip Tulak and Stuart Richards. 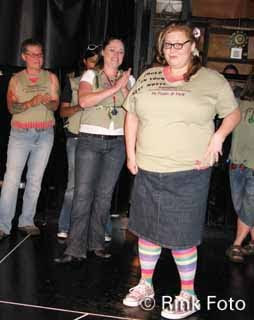 The high point of the party was the T-shirt contest, with five women volunteers strutting on stage, and the winner was chosen by audience applause. Joan Weir, Laura Naumann, Samantha Sullivan, Jeanne Freebody, and Jukie Sunshine contended for the big gift bag, and Jukie Sunshine came out on top. Executive director K.C. Price made the rounds, thanking everyone for a successful festival. Communications coordinator Cindy Emch kept the event flowing smoothly, and organized the serving of the eagerly awaited pizzas. Champion volunteers at the party included J.P. Culpepper and David Delrosario, who also volunteer at Under One Roof, Stardust and Raj who also volunteer with the Faery Nomenous group, James Poole, who also volunteers for the South Bay Bears and the Santa Cruz Diversity Center, and Rick Solomon who helps out with Folsom Street Events and is the Frameline database consultant. The San Francisco International LGBT Film Festival was founded by Bern Boyle in 1977, with inspiration from New York City film scholar Vito Russo of “The Celluloid Closet” fame. Boyle was a featured player in George and Mike Kuchar’s masterpiece “Thundercrack”, which was screened at the festival. He had a much-discussed sexual encounter with a gorilla in the extremely outrageous film. And the Kuchar Brothers were honored by Frameline for their avant-garde low-budget movie careers this year. When Bern Boyle died, the festivals’ first couple of years’ posters and flyers, and a founding affirmation letter were sent to San Francisco, and copies were distributed to Frameline, the GLBT Historical Society, and the San Francisco Public Library’s James C. Hormel Gay & Lesbian Center. 2009 was Frameline’s 33rd year, and it was the best yet. Eleven days, 210 films, and the large appreciative audiences that packed the screenings and parties were a testament to the choices made and the funding of donors and sponsors, even during an economic crisis.